Take it easy this Christmas and visit Plymouth Market for all your shopping from food and treats through to great presents. You can even enjoy our parking for less: it’s just £1 an hour to park in our car park with space for over 50 vehicles. During December until Christmas we’re open 7 days a week, with late night shopping on Thursdays to give you longer to look for and buy all the things you need to make your Christmas special. We’ve got an amazing range of stalls to choose from, selling everything you can imagine, from underwear to hair extensions, antiques to backpacks, confectionary to sausages, jewellery to furniture, pineapples to pasties and everything in between! You really can find everything from diamond rings to novelty slippers, all under one big roof in Plymouth Market. Every Saturday in December we’ll be running children’s Make and Take workshops to build a LEGO® bricks penguin or mini Santa. Buy a Golden Ticket to be part of the Make and Take for just £5. In addition to our fantastic range of stalls and friendly stallholders, this Christmas the Market is home to Santa and his helpers. Taking a break from his busy world-wide delivery schedule, Santa and his elves will be spending Saturday 15 and 22 of December in the Market. You can buy a Golden Ticket to see Santa for just £3. 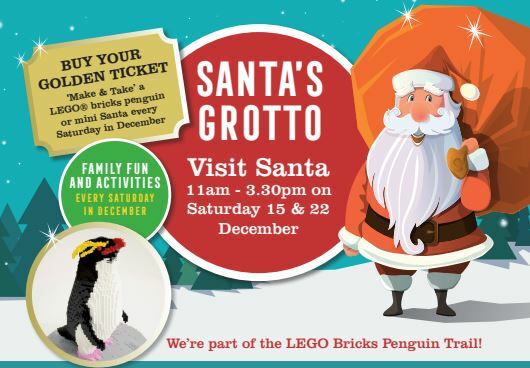 For £6 you could buy a Golden Ticket to see Santa and make and take a LEGO bricks penguin or mini Santa home with you. Each Golden Ticket also entitles you and your family to a fantastic 10% off our fabulous eateries throughout December. So whether you’re hungry for an all-day breakfast, some spicy noodles or pizza, or just need to keep your energy levels up with a yummy slice of cake and a brew, you’ll be able to enjoy it for less – just show your Golden Ticket when you order to save. Purchase your Golden Ticket from Plymouth Market today. Look out for all the other exciting things happening every Saturday in December before Christmas – lots of family fun! We’re also part of Plymouth’s LEGO Bricks Penguin Trail so visit us and find out all about our two penguins for your chance to win a family trip to LEGOLAND®. So what are you waiting for? Plymouth Market is the place to shop this Christmas – from penguins to pyjamas – we’ve got the lot!